Typhoon RAMMASUN started to weaken about 20 degrees latitude, and the shape of clouds are getting less organized. By tomorrow morning, Izu Islands, especially in the south, will be hit directly by the typhoon. Hachijojima Island is now within the area of strong winds, and a large amount of rainfall was already observed (reference: AMeRAS / / AMeRAS on Google Maps). 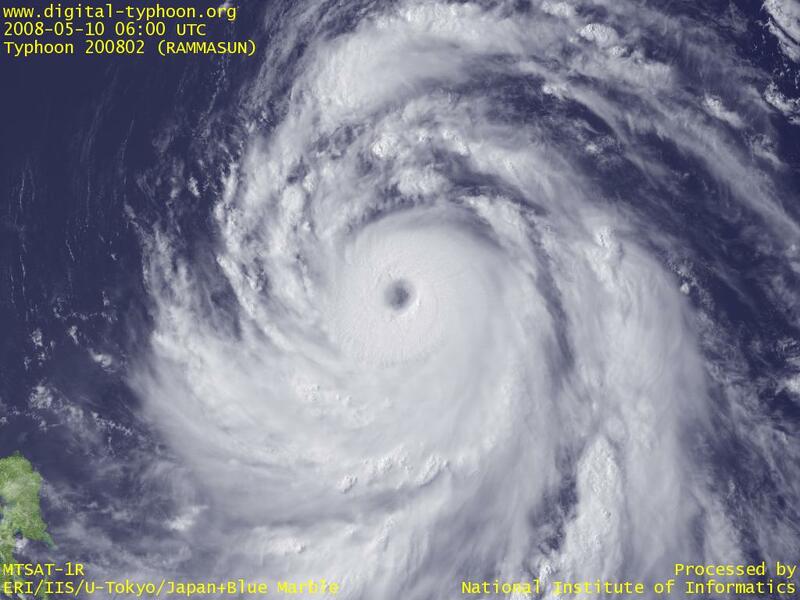 Typhoon RAMMASUN has well-balanced cloud shape from the beginning, so it keeps steady intensification. The typhoon is forecast to keep deepening for one more day when the typhoon is expected to reach its peak intensity. The image below shows a visible image at 06UTC, which shows the eye at the center, and surrounding clouds spiraling around the center in a magnificent scale. At the time of observation of the above image (06UTC), Joint Typhoon Warning Center (JTWC) estimated the intensity as 125 kt (64m/s) maximum wind, and 150 kt (7m/s) gust, which is already more intense than the peak intensity of Cyclone NARGIS, which gave enormous impacts on Myanmar. If we compare the above image with the image of Cyclone NARGIS, both of which are rendered in the same scale, they show that this typhoon is larger than Cyclone NARGIS. This means that typhoons with stronger intensity than Cyclone NARGIS are not unusual, and in terms of size, Cyclone NARGIS was not a "large" cyclone. But we should remember that the above comparison was made between a typhoon over a remote ocean and a cyclone that just made landfall. If a typhoon of this intensity made landfall, even in Japan we will see extensive damage. Typhoon RAMMASUN was formed in east of Mindanao Island. This typhoon is forecast to move northward off the coast of Philippines with steady intensification.